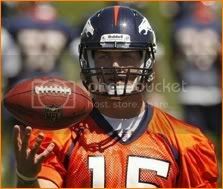 With his first NFL minicamp in the rear view mirror, former Florida Gators quarterback Tim Tebow returned to Denver, CO, Monday for his first set of organized team activities (OTA) with the Denver Broncos at their Dove Valley facility. While some local columnists like The Denver Post’s Woody Paige continue to wax poetic about Tebow’s potential, others like ESPN’s resident gasbag Rick Reilly prefer to bash Broncos head coach Josh McDaniels for his decision to draft him. Attention, hype and potential resent from teammates have never bothered Tebow, and he proved just that during a short media availability after his workout. Tebow was listed as the fourth quarterback on the team’s depth chart behind starter Kyle Orton and back-ups Brady Quinn and Tom Brandstater. 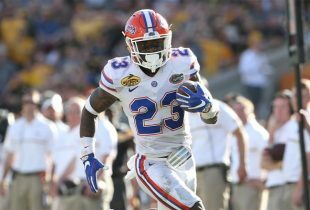 He threw less than a dozen total passes Monday and even took some time to toss the ball back-and-forth with former Georgia running back Knowshon Moreno. Without all the hate he received in preparation for the draft, I would have never watched an OTA video of Tim. Now here I sit comparing throwing motions. 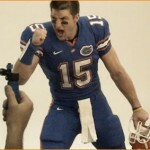 kind of funny…Tim Tebow vs Tom Brandstater….one of the biggest names in football vs who?